Sometimes Omega Recoil is just adding to the ambiance, such as in this piece, also provided by Jon Sarriugarte. NIMBY’s “Do It for Haiti” fundraiser. Sometimes, even when things go wrong, they look awesome. 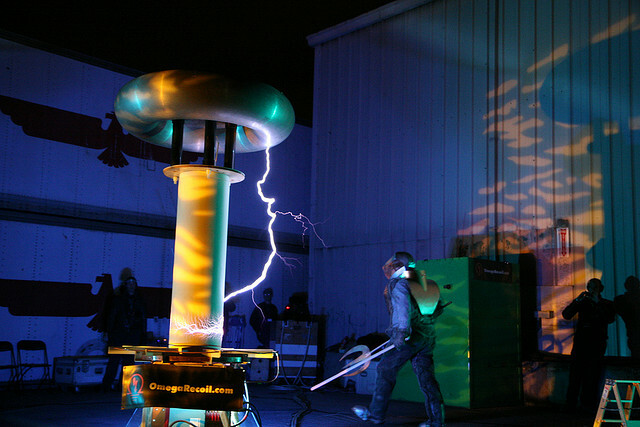 Here’s a shot from our Do It for Haiti show that William Keller caught of a strike to our secondary coil. OUCH! That’s not supposed to happen. Great shot, but that’s going to take a LOT of work back at the shop to fix. Most likely we’re going to have to replace that secondary completely. Jon Sarriugarte caught some great footage of our show at NIMBY for the “Do It for Haiti” fundraiser.